Purple Panthers should have depth to hold off challengers. 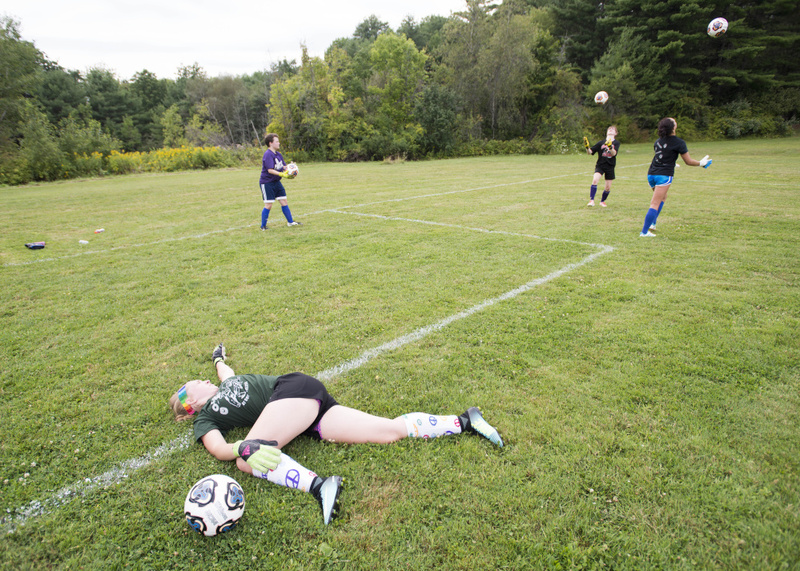 The Waterville Senior High School girls soccer team took big hits from graduation and injuries, but the Purple Panthers likely have enough pieces remaining to remain as the team to beat in Class B North this season. Kennebec Valley Athletic Conference Class B Player of the Year, Jordan Jabar, graduated while the team’s leading scorer from a season ago, Sophie Webb, was lost to a season-ending injury before the preseason. A pair of unheralded faces will look to fill the voids with breakout seasons. Senior midfielder Anika Elias was second on the team with 27 goals as a junior, and she’ll be asked to provide ample scoring in Webb’s absence. Another senior, Mackenzie St. Pierre, will play alongside Elias in the middle, just ahead of classmate Becca Beringer — an outside back a year ago who only got better as the season went on. Beringer will move into the central role that Jabar previously occupied. “They’re good enough to control the midfield,” head coach Mark Serdjenian said, noting that goal-scoring will have to come from several players. After rolling all the way to the Class B state championship game in 2016, there could be a few proverbial bumps in the road for the Panthers this time around, but some of the younger players a year ago, including Sadie Garling, a sophomore, who scored the only goal in the 1-0 regional final win over Hermon, earned varsity minutes that should pay dividends this season. At Erskine, Ryan Nored said he likes what he sees from his team, which has a strong group of returning players from a playoff team a year ago. A healthy Kayla Hubbard, who centers the midfield, leads the charge. With a supporting cast that includes Lauren Wood, Lydia Boucher, Annemarie Allen and emerging striker Haymanot Maynard, the Eagles could challenge Waterville and the rest of the traditional B North iron. Other teams in the region think this could be a year for an upset. MCI head coach Autumn Pepin says there’s room for some new teams in the top half of the North. “I think this year there’s a window for a team like ours to move into those two through five seats in the playoffs,” said Pepin, whose Huskies made the playoffs last year without a senior on the roster. MCI joins Winslow and Nokomis as programs that took lumps with younger players over the last couple of years but believe they’re ready to contend. After holding opponents to a goal or fewer on seven occasions a year ago — but going just 6-5-3 in the regular season — the Black Raiders are hoping to find enough goal production to turn those games into wins. New-look Messalonskee will try to make a deeper run in the Class A North tournament this season. Without a prototypical target striker up top, coach Penny Stansfield will try and utilize the pace the Eagles have on the ball to create a different type of attack. Quick counter-attacks will become more of an option, the absence of which often slowed the team against the Bangors and Camden Hills of the KVAC A a year ago. Sophomore Lydia Bradfield, who was a second-team all-conference selection as a freshman, is a big reason why the Eagles are morphing into a transition team. Bradfield is exceptionally fast, particularly with the ball at her feet. Her ability to create, on and off the ball, should open up scoring opportunities for teammates. It won’t be a top-heavy offense from the Eagles. While Messalonskee eyes a deeper run into the tournament, Cony, Skowhegan and Mt. Blue will all try to find their way back in after missing out last season.